Robert Cedric Sherriff (1896-1975) was a playwright and writer who is known primarily for Journey’s End (1929), probably the best-known play about the First World War. He wrote one science fiction novel: The Hopkins Manuscript (1939; reissued as The Cataclysm in 1958). The protagonist is Edgar Hopkins, and his account of the catastrophe that resulted from the Moon crashing into the Earth is discovered hundreds of years later by archaeologists from Addis Ababa. The science is silly; but I remember being gripped by it when I read it at the age of 12 or so, in the Pan paperback of 1958. It stands in a great British tradition of disaster novels, which runs from Wells through Sherriff to Wyndham, Ballard and many others. Sherriff was born at Hampton Wick in Middlesex, the son of an insurance clerk. He was educated at the grammar school at Kingston upon Thames, and then worked for the Sun Insurance office from 1914 to 1915, when he joined up, and again after the war. 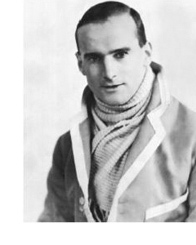 In 1921 Sherriff wrote a play as a fund-raiser for his Kingston Rowing Club (whose blazer he is wearing in the photograph above): they needed money for a boat repair. It was a one-after, a short play staged after other entertainments. It was performed at the Gables in Surbiton; he and his brother both played in it. It was so successful that the Rowing Club decided to make it an annual event. After doing this for several years, Sherriff thought he would try to go professional. He sent a play to an agent, Curtis Brown; it was rejected. He tried a novel, but realised that it would work better as a play: this was Journey’s End. Curtis Brown took it, and introduced him to the war poet Geoffrey Dearmer, who was in the Incorporated State Society. The Society agreed to put it on for two performances, on 9 and 10 December 1928. The then unknown James Whale was director, and Whale chose the equally unknown Laurence Olivier to play the main role of Stanhope. Olivier wore Sherriff’s own uniform for the part. Sherriff was too nervous to sit still for the whole play, and he saw that the applause was half-hearted at the end. His mother pointed out that it was difficult for people to clap when they were crying. The reviews were excellent, and the play was taken up by Maurice Browne. It opened up at the Savoy Theatre in the West End on 21 January 1929, with the original cast, except for Olivier, who was playing in Beau Geste. It was a huge hit, and Browne did a deal with an American producer to take it to Broadway. The proviso was that Sherriff had to go over to New York. He was very reluctant to give up his £6 a week job with Sun Insurance, but his boss gave him a year’s leave. The play had a run of 594 performances in London, and almost as many on Broadway. It was in America that the myth was born that the play was written so that his rowing club could buy a new boat: Sherriff hadn’t the heart to tell the journalist that this was not true. Not only did the play do well on the stage, but in print as well. Among the audience at the first performance had been Victor Gollancz, who sought Sherriff out in the interval and said that he wanted to publish it. According to Sheila Hodges (Gollancz: The Story of a Publishing House, 1928-1978, Gollancz 1978), Gollancz’s firm could hardly keep up with the demand: “At one time the paper for five successive reprints was coming down from the paper-makers in Scotland to the printers in Southampton” (p. 47). Over the decades, the play sold nearly 80,000 copies: – “an enormous number for a play” (p. 48) – and it “remained a landmark in the firm’s existence; and so deep an impression did it make on Victor that in later years he often referred to it as his ‘first publication’, though in fact it was more like his seventy-first” (p. 48). His next two plays were not very successful, and he decided to do what he had long wanted to do: to read history at Oxford. He went to New College in 1931. After only a year he was asked to write the screenplay for H.G. Wells’s The Invisible Man in Hollywood, and he gave up the student life. His most successful screenplays were probably Goodbye Mr Chips (from the book by James Hilton), The Four Feathers (from A. E. W. Mason’s novel), and, much later on, The Dam Busters. He wrote several novels, and an account of the putting on of Journey’s End, called No Leading Lady (1968). He lived mostly in Esher, Surrey; he died in Kingston upon Thames. Most of my information is from J.C. Trewin’s entry in the Oxford Dictionary of National Biography, revised by Sayoni Basu, from Sherriff’s No Leading Lady, and from the online Great War Literature Magazine.